You should not use hydrocortisone, neomycin, and polymyxin B otic if you have a hole in your ear drum (ruptured ear drum), or an ear infection caused by chickenpox, or herpes infection. Neomycin and polymyxin B are antibiotics that fight bacteria. 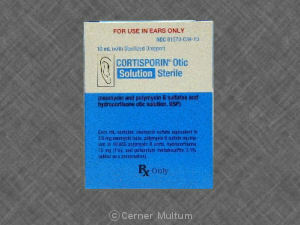 Hydrocortisone, neomycin, and polymyxin B otic (for the ears) is a combination medicine used to treat outer ear infections caused by bacteria. This medicine is not for use in treating an inner ear infection. Hydrocortisone, neomycin, and polymyxin B otic may also be used for purposes not listed in this medication guide. What should I discuss with my health care provider before using this medicine? an ear infection caused by chickenpox, or herpes infection (simplex or zoster). if you are allergic to an antibiotic similar to neomycin, such as kanamycin, paromomycin, streptomycin, or gentamicin. FDA pregnancy category C. It is not known whether hydrocortisone, neomycin, and polymyxin B otic will harm an unborn baby. Tell your doctor if you are pregnant or plan to become pregnant while using this medicine. Hydrocortisone can pass into breast milk and may harm a nursing baby. Tell your doctor if you are breast-feeding a baby. Do not use this medicine in a child younger than 2 years old. Before using this medication, clean and dry your ear canal with sterile cotton. Shake the ear drops well just before each use. Stay lying down or with your head tilted for at least 5 minutes. You may use a small piece of cotton to plug the ear and keep the medicine from draining out. As an alternative to dropping the medicine into your ear, you may insert a small piece of cotton into the ear canal and then drop the medicine directly onto the cotton to soak it. Leave the cotton in your ear for at least 24 hours, and keep it moist by adding a few drops of the medicine to the cotton every 4 hours. Replace the cotton at least every 24 hours. Follow your doctor's instructions about the use of cotton with this medication. Call your doctor if your symptoms do not improve, or if they get worse while using hydrocortisone, neomycin, and polymyxin B otic. Do not use hydrocortisone, neomycin, and polymyxin B otic for longer than 10 days in a row unless your doctor tells you to. Long-term use of neomycin may cause damage to your hearing. What should I avoid while using this medicine? This medicine is for use only in the ears. Avoid getting the medicine in your eyes, mouth, and nose, or on your skin. Rinse with water if this medicine gets in or on these areas. skin rash, redness, swelling, itching, dryness, scaling, or other irritation in or around the ear. mild itching after using the ear drops. It is not likely that other drugs you take orally or inject will have an effect on hydrocortisone, neomycin, and polymyxin B otic used in the ears. But many drugs can interact with each other. Tell each of your healthcare providers about all medicines you use, including prescription and over-the-counter medicines, vitamins, and herbal products. Your pharmacist can provide more information about hydrocortisone, neomycin, and polymyxin B otic. Copyright 1996-2017 Cerner Multum, Inc. Version: 2.05. Revision date: 12/3/2014.